Stony corals produce huge reef formations in tropical and subtropical waters. The small marine animals called polyps that are responsible for their growth are embedded in limestone cases. But the polyps can't move around the ocean floor. So, how exactly do they find mates? Stony corals reproduce by sexual reproduction and contain both male and female genetic material. Once a year, on cues from the lunar cycle and the water temperature, entire colonies of coral reefs simultaneously release their tiny eggs and sperm, called gametes, into the ocean. This spawning proces produces large clouds over a coral reef, bringing down visibility considerably. When a coral egg and sperm join together as an embryo, they develop into a coral larva, called a planula. Planulae float in the ocean, some for days and some for weeks, before dropping to the ocean floor. Then, depending on seafloor conditions, the planulae may attach to the substrate and grow into a new coral colony. Indo-Pacific reefs My first encounters with coral reefs were in the Red Sea where magnificent stony and soft corals, and superb drop offs took my breath. Smaller colourful fish swarmed close to the coral branches, while schools of larger fish often passed by in the blue water near the wall swimming against the current. Exciting places for the underwater photographer are the sandy plateaus often found at the points of a reef where strong currents bring in lots of nutrients and often also the larger predators. The South West point of Sanganeb in the Sudan was such a place, with grey reef sharks prowling over the plateau and hammerheads passing by at greater depth in darker and colder water. The complexity and beauty of the Indo-Pacific reef with its seemingly endles variety of animal species is hard to put into words. Groups of colourful fishes like snappers, anemone, damsel, soldier and butterly fishes often huddle together in their niches. If you return to a reef or drop off after a years absence, you will likely find the same group or even family in the same crevices and habitats were you had spotted them in the year before. Larger predators move in at dusk, when the dynamics of the reef reef changes its character. The coral reef is not only a very old but also a rich, mighty and mysterious ecosystem where each living being depends on species in its environment, like in a tropical rain forest. Corals are fragile structures that can easily be damaged by novice divers not able to control their buoyancy, and even underwater photographers seeking a point to stabilize themselves along a reef wall to make that ultimate shot. The greatest danger however seems to come from environmental factors like water pollution, sedimentation and rising seawater temperature levels. Rising seawater temperature is considered as one of the causes of coral bleaching; a sign that a coral formation is in peril. Coral bleaching Corals that form the structure of the great reef ecosystems of tropical seas depend upon a symbiotic relationship with zooxanthellae. Zooxanthellae are photosynthetic single cell algae that are concentrated in the tentacles of the coral polyps. They only occur in the polyps of shallow reef building stony coral formations (Madreporaria) with their limestone skeletons. Non reef building soft corals (Alcyonaria) do not have a stony skeleton and lack symbiotic algae. Because they depend less on bright sunlight, soft corals are often found at deeper locations of a reef where they feed on plankton by extending their branches and tentacles over long distances, at least when there is sufficient current. The Great Barrier reef Outbreaks of coral bleaching have been observed in the last decades at several places of the world, with the Great Barrier Reef as the most dramatic example. 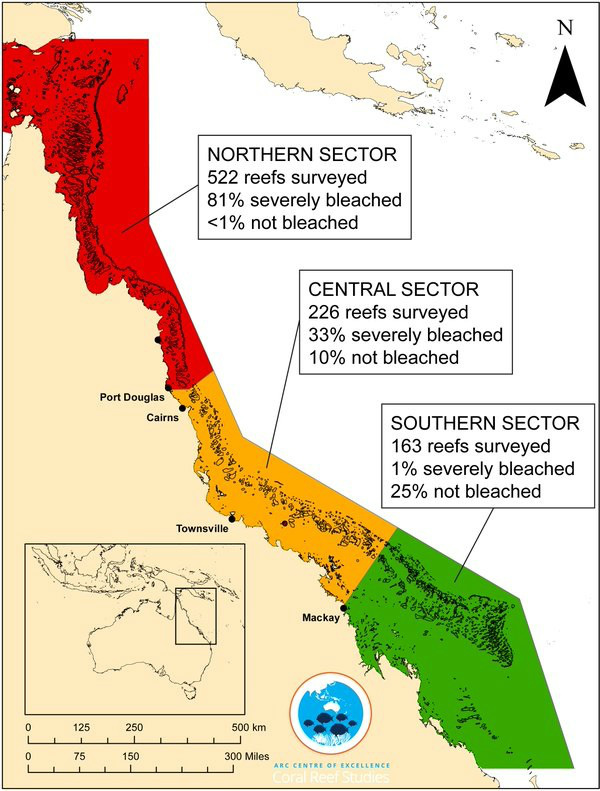 A recent aerial survey of the Barrier reef found severe bleaching in offshore reefs in the central part of the Reef, which last year escaped widespread severe bleaching (see picture above). Terry Hughes, director of the ARC Centre of Excellence for Coral Reef Studies conducted the aerial survey that confirmed both 2016 and 2017 bleaching events. According to Hughes the bleached corals are not necessarily dead, but the one-two punch of consecutive bleaching events brings the Northern part of the Barrier Reef in a critical condition*. Climate or environment? What are the causes of the disaster: natural factors or the environment? For some time El Niño was seen as the main factor behind the warming of seawater, but bleaching of corals continued also in the years that followed. Damage to the environment by massive fossile burning and global warming are more likely. Some people see the big oil companies are the main culprit. But then we should add: with consent of national governments giving priority to economy instead of ecology. An important factor are also the huge coal mining projects at Queensland. So not only warming of the seawater, but also pollution and sediment generated by the industries in North East Australia itself, and some recent violent storms could have contributed to the current damages in the northern and central sectors of the GB reef. The sceptics. There are still people that feel that the dangers of climate change and pollution are exaggerated by the 'environmentalists'', that is dedicated groups or individuals that are concerned about about the future of the coral reefs, the tropical rain forests and its inhabitants. Since sceptics are sceptical of the claims of environmentalists, they often come close to denial of the effects of environment which in my view ends up in ostrich policy. An example is Bob Halstead, a respected senior member of our underwater communitity, who recently expressed his view about coral bleaching on the GBR in the Underwater Photograpy magazine edited by Peter Rowlands**. He feels that the picture and perspective presented by Australian scientists is far too pessimistic. "History tells us that corals killed by bleaching will recover within a few months, and those killed will rejuvenate within a few, say 5-10, years." Okay, lets hope Bob is right, but we cannot dismiss the possibility that the present conditions on the GBR could be far more acute than those that existed twenty or thirty years ago. Not only because of rising sea water temperatures, but an interaction of several factors. What we witness could be a sign of a long term process that remained concealed for many years, but that is now becoming manifest with effects that will be difficult to reverse. Instead of depicting enviromentalism as a conspiracy from the left side (as BH does) I feel that the environment is something that all people -liberals and conservatives- that care about the underwater world should be concerned about. We should also take the reports of natural scientists and marine biologists seriously, since these people have the knowledge and skills to provide detailed and objective information. If our industries are indeed responsible for leaking chemicals that are killing the coral reefs, it is a duty for all of us to share forces and tell the responsible captains of industry and politicians to put and end to the disaster. The Great Barrier Reef: a catastrophe laid bare". The Guardian. 2016-06-06. ISSN 0261-3077. Retrieved 2016-10-15. **Bob Halstead. Coral Bleaching on the GBR. Under Water Photography, nr 96 May/June 2017. 33-39.